It's been fascinating to watch the trajectory of Stoned Jesus, Ukraine's greatest stoner rock band. They went from being an also ran in the world of heavy fuzzy to now, on their fourth album Pilgrims where they are pushing a sound that fuses Mastodon with Queens of the Stone Age and a healthy touch of Melvins or even Faith No More. 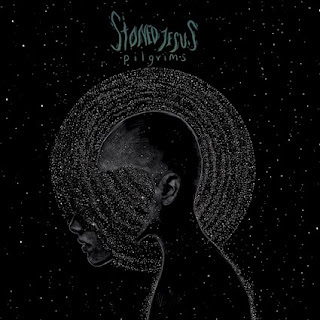 While they have always been much more of a 'rock' band than many of their riff worshiping peers, Stoned Jesus seem to have really come into their own with this latest offering. Everything about Pilgrims makes this feel like a much more professional effort from Stoned Jesus. Not only is this their Napalm Records debut, but it is also an album that has cleaner execution and delivery than anything they have done before. The production is cavernous and wonderfully warm. You can almost see yourself crawling up inside the home that Pilgrims creates for you out of pure beautiful sound and falling asleep. There is something strangely comforting about the mass of this record. The girthy riffs and next level songwriting all are a testament to what Stoned Jesus has been able to conjure up. Stoned Jesus had a bit of a make it or break it moment not this album. They could have, after peaking with 2015's The Harvest fallen into fuzz laden obscurity. But they didn't. Instead they created their most potent, accessible and exciting record to date. They crafted something that was not only next level but also which hinted at whole new vistas that the band could embrace. If you can't fall in love with what Stoned Jesus have done here, you just straight up don't like heavy rock music. This is big, majestic and you're not going to soon forget it.